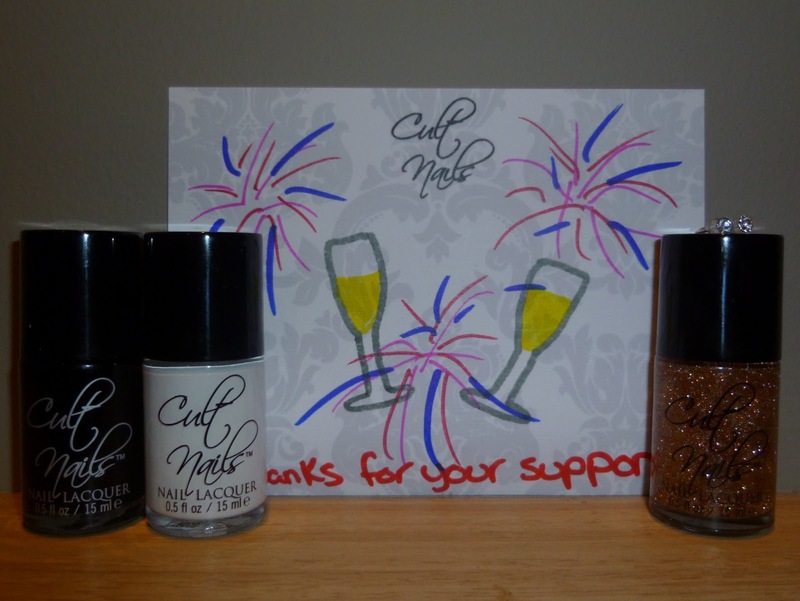 First Nail Mail(s) of 2013! 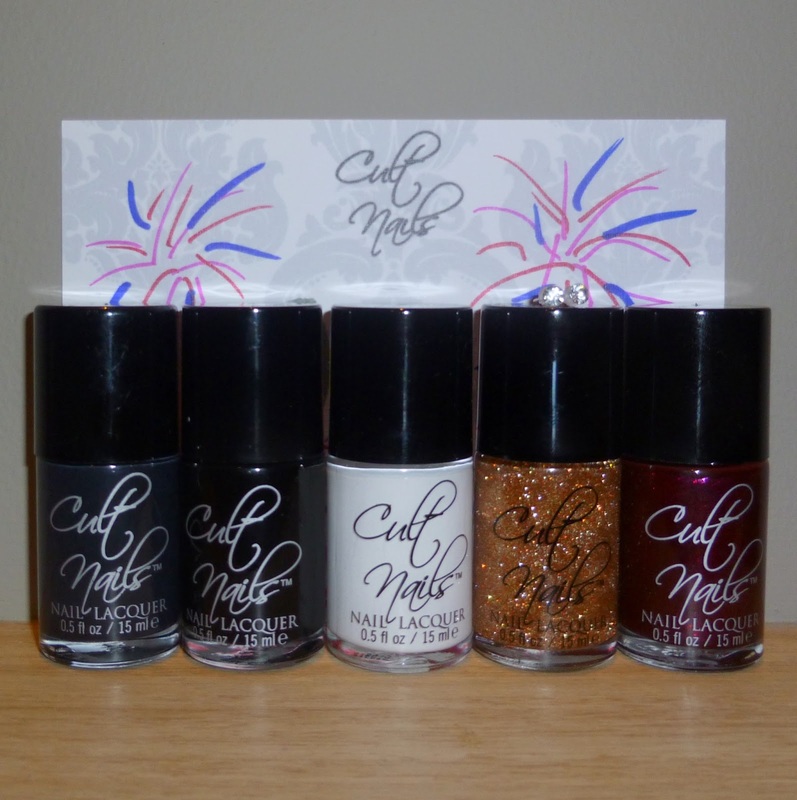 First up nail mail from 365 Days of Color! 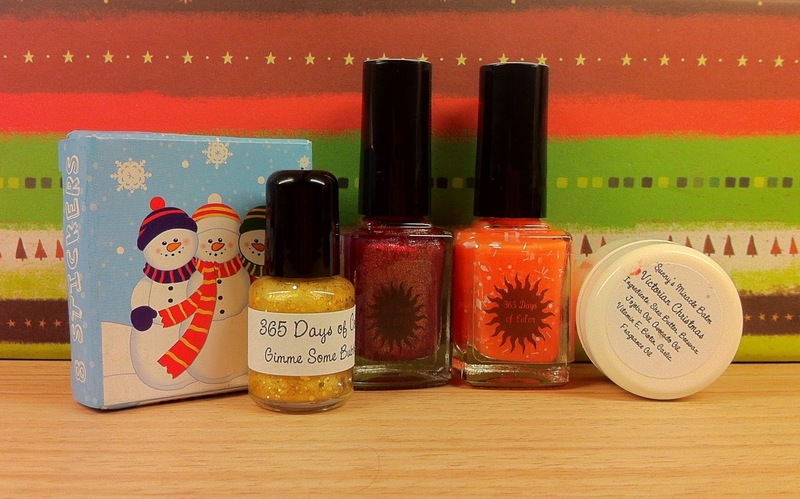 I got the Christmas grab bag for just $15 during one of the 12days of offers from Sunny! *Yay* In it came a full sized Mrs Claus (limited edition polish which only came with the grab bag) and Killer Kiss from the Toxic Love Collection, a mini Gimme Some Bubbly from the Holiday Collection. Sunny also included a mini miracle balm in Victorian Christmas, some Christmas themed stickers and candy canes (not pictured). Next up, my order from Llarowe! I grabbed this babies during one of the flash sales that Leah Ann had. These were all from the Going, Going, Gone section. If I remember correctly I got a 30% discount on these beauties! And last but definitely not least – my order from LynBDesign. Are you wondering why I am showing you only the back of these bottles? Well, the reason is because that some of these bottles do not have labels. Read on to find out why! 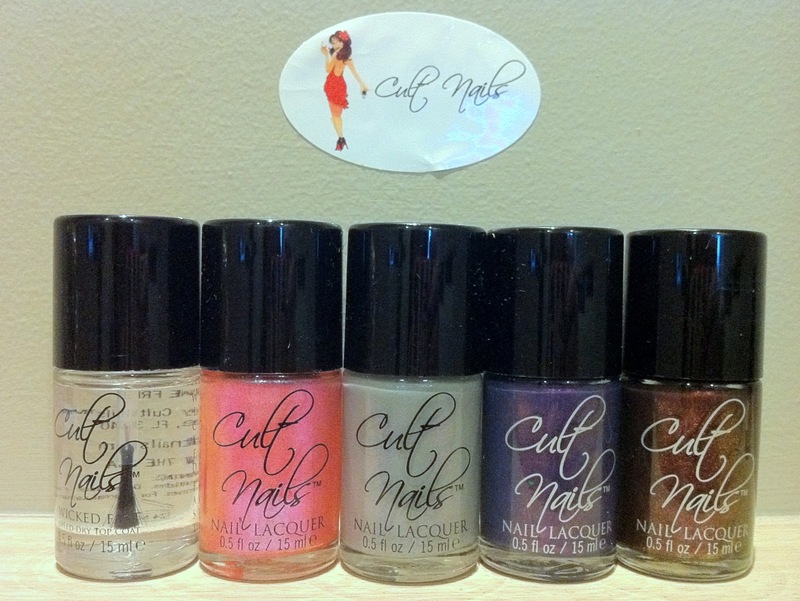 I took the opportunity to grab more Cult Nails goodies while they were having the offer on grab bags! I did not buy many colors this time. I pretty much decided this would be a good time to stock up on Wicked Fast top coat! (I grabbed 3). I also got a convert pack with Charlatan and Nevermore (not pictured) as well as Flushed, Afterglow and Disciplined from their new collection! Talk about being lucky! This was what I had in my grab bag – another bottle of Flushed! !, 2 wheels of multi-colored square and rectangular rhinestones and 2 pots of metallic studs! I placed an order with the lovely Stacy from Glitzology not too long ago while she was having a $5 sale. I have always been drawn by her polishes since I saw them popping up on Facebook but never bought any due to shipping cost and currency conversion. But when I saw that she was having the $5 sale, I just bit the bullet and placed my order. I do not regret it one bit! Stacy was really nice and really quick with shipping. She even gave priority to international order so that they would arrive before Christmas. 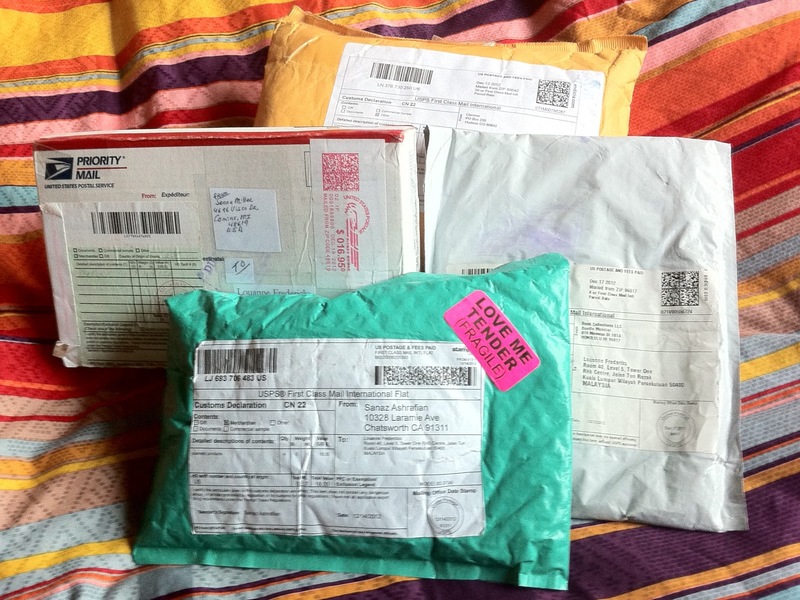 Guess what – I believe that luck was on my side and my parcel came in just 8 days! When I told my mom to look out for nail polishes in Australia and probably grab a few for me she was kind of hesitant. Well, it is because in her mind nail polishes are expensive. I was at work when my mom came back and she did not tell me anything about her purchases for me. So imagine the joy when I came in my room to find a small bag with 4 polishes in them. I was literally beaming! When I went to thank my parents, they were like – What 4 polishes? We bought you 8 bottles of nail polish! I was ecstatic! My mom’s choice in colors were much different from what I would pick. She did call and ask me what I would like, but not knowing much about color choices there I told her to just pick what she thought was nice. One thing my mom managed to do was to pick colors that were new to what I had at the time that she left. Yup, I recently got similar colors from an Aussie Swap. Talk about coincidence! Though they are similar they aren’t exactly the same. I shall post a comparison post one day! I am thinking to go out and grab a nail wheel for that. Fingers crossed that I can do that by the end of this week! 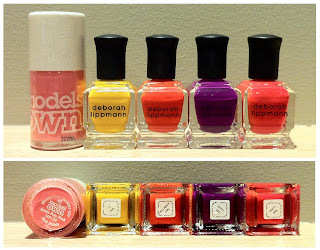 First up, I got myself a Deborah Lippmann Run the World (Girls) set! I haven’t gone crazy and splurged that much on polishes, I only got his because it was on SALE! Back in September, I bought a Groupon which gave me a chance to grab this at RM107 instead of RM287! That is a whooping 63% off! The set came just in time for my birthday but it wasn’t perfect, can you see it in the photo above? How about in the photo below? I contacted the seller and they said it was a manufacturers defect and they sent me Pink Blush as a replacement. Not to bad I guess. Next up I have 2 essence color3 polishes i picked up at a temporary essence stand in the maill. 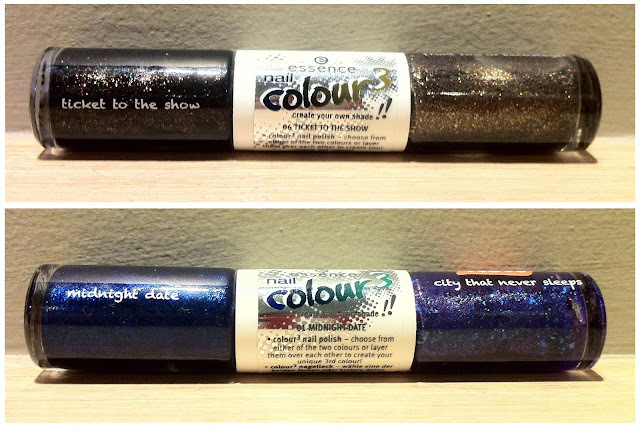 The colors I picked was 06 Ticket to the Show and 01 Midnight Date. Last but not least I picked up a few polishes from the new OPI holiday collection! I was tempted to buy more than this but I told myself to be good and only picked up Skyfall and Goldeneye. Wait a minute! I picked up 9 polishes! That’s not exactly a few. I think my limit was 10 polishes this month. LOL! Not so good afterall I guess.